There was a rumor on Twitter last month saying that delicious would end – I was in complete panic because I find the tool extremely useful; luckily, it appears to be just that: a rumor. Preheat the oven to 180°C/350°F. Butter a 28x18cm shallow baking pan, line with baking parchment, making sure that the paper comes higher than the rim of the pan, and butter the paper as well. In a medium bowl, using an electric mixer, beat the cream cheese until soft and creamy. Add the vanilla bean paste or extract and caster sugar and beat until smooth. Set aside. Place the eggs, butter, brown sugar, flour, baking powder, salt and vanilla in a separate bowl. Beat for about 2 minutes until pale and creamy. Spread half of the cake batter mixture onto the base of the prepared pan, then dollop half of the cream cheese mixture over it, spreading an uneven swirl through the base mixture. Scatter with half of the plums. Spoon the remaining cake batter on top and dot with the rest of the cream cheese. 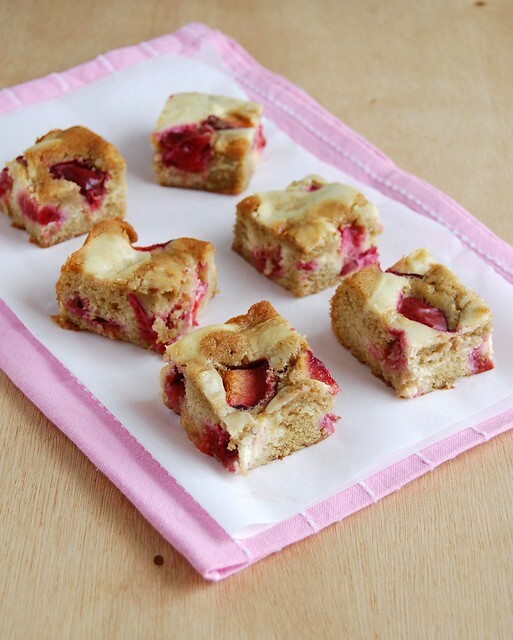 Scatter with the remaining plums then bake for about 45 minutes until risen and just firm to touch – when cooked, the surface of this tray bake should feel just firm to the touch, but bear in mind that it will firm-up slightly as it cools; if over baked, it will lose its moist texture. Leave to cool in the pan before cutting into pieces. Serve warm or cold, with ice cream. 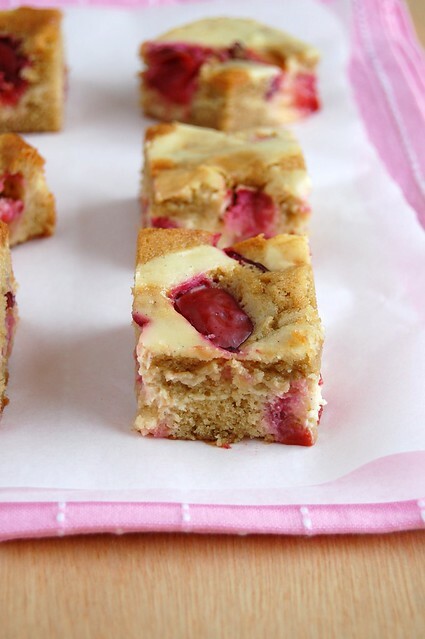 I truly love the specks of pink in the cake. I love the colour of the pink! These look really mosit and tender. These are beautiful and they look sooooo yummmyyyyy! This sounds delicious Patricia...and we are in plum season here too. Really gorgeous shots and locely blog too. That cream cheese swirl sounds delightful with the fruit, a very nice pairing. These are so pretty and I bet they are delicious. They'd be fun little bites for a little girl's tea party. Gorgeous! It plums were in season I would make this right now! Una maravilla una exquisites una delicadeza de blog ,me quedo acompañandote con otras amigas y desearte un año lleno de bendiciones,abrazos y cariños. I made this cake, but substituted with red berries. Truly tasty and the cheeecake ripple added a nice dimension to the taste and texture. I tried your recipe and posted its Turkish version on my blog. It's a great recipe. Thank you!